At the 2014 Drifting World Championship, world records were broken like plates in a bull-ridden china shop. Earlier this week, we reported on Han Yue’s new record for parallel parking. 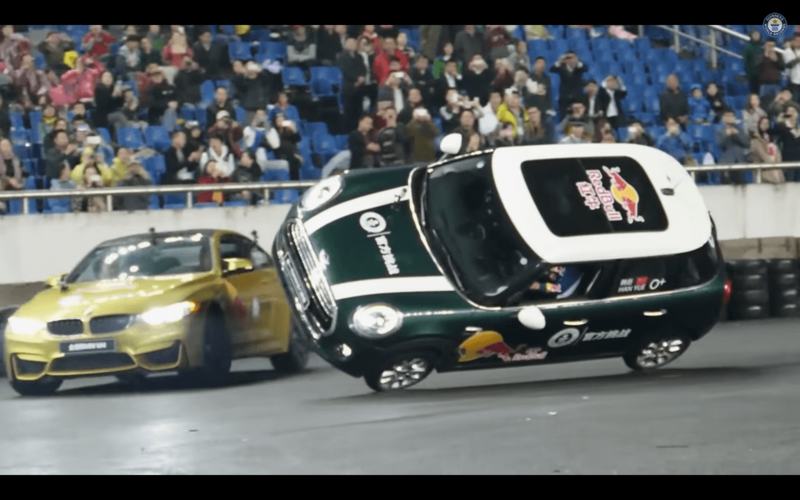 The Chinese stunt driver slid his MINI 3-Door Hatch between two others at motoring event, with only 3.15 inches of room to spare in total. You’ll recognize the background (and the MINI driver) in a new video posted by Guinness World Records, which shows drifter Zhang Shengjun establishing a new benchmark for donuts done in a minute. Actually, the true record is ‘most donuts around a car driving on two wheels in one minute,’ but that doesn’t exactly roll of the tongue. A BMW M4 was the circularly gifted athlete for the attempt, while a MINI, driven by parking wiz Yue, performed the impressive balancing act. Shengjun managed 10 full rotations around the plucky British car in 60 seconds, gracefully enveloping the 5-door like an ice dancer at the Olympics. The sporty coupe flirted with collision a couple of times, but Shengjun’s masterful driving (and Yue’s steady hands) kept all the paint in the right place. Turns out, that was exactly what they were thinking, because Guinness World Records jumped a damn tractor-trailer over a Lotus racecar. You may not think that’s so impressive on its own, but the cars were pacing down a racetrack at well over highway speeds before the jump. And then, as the semi launches off the ramp with the grace of an angry hippo, the F1 car slides underneath with surgical precision. Oh, Guinness. What’ll they think of next?